Students will learn the history behind “This Little Light of Mine”, following the song through slavery, the civil rights movement, and up to its current day applications. Students will also learn to sing the song itself in multiple languages and will be prompted to write about their learning experiences after each session. At the end, there will be an opportunity for students to add their own verses to the song, based on the writing they did through each portion of the lesson. Prerequisites: Basic knowledge regarding the history of slavery and the civil rights movement in the United States is helpful but not required. Prompt: Why do you think it’s important to learn “This Little Light of Mine” and the history behind it? At the end of the lesson address the class as a whole as to their engagement, behavior, and focus during the lesson. If praise is not warrant, suggest ways in which they can improve their collective performance for the next class. If you choose to do the extension project, you can instead read through students’ journals and comment on their reflections, effectively starting a written dialog with each student. Prompt: Write about a song in your life that has meant a lot to you. Why was it important to you and what purpose did it serve? Fannie Lou Hamer, a hero and a leader of the Civil Rights Movement, sang this song outside the Democratic National Convention in 1964, where she was fighting for all Americans, regardless of race, to receive the right to vote and to have real political representation. Her efforts helped to change the world. Everywhere we have played over the years, people know and love this song and sing along. This recording was made at the home studio of Dan Zanes, with the Children of Agape Choir. I came to know the choir through the Geier Family, whom I had known during my years of teaching on Roosevelt Island. Their older daughter had been a student of mine. The Geiers’ younger daughter, Hallie, died after being struck by a car in 2004 at the age of 11. Hallie was an activist and a poet, and had raised money to donate to children in sub-Saharan Africa. The Geiers were determined to keep Hallie’s remarkable spirit of optimism and compassion alive, and they brought the Children of Agape choir to the United States for the very first time. The children are all from the Agape orphanage in South Africa, and have since been the subject of an award-winning documentary called We Are Together. Prompt: What have you learned about the world and yourself through studying these three versions of “This Little Light of Mine”? Extension (Optional): What’s the point? 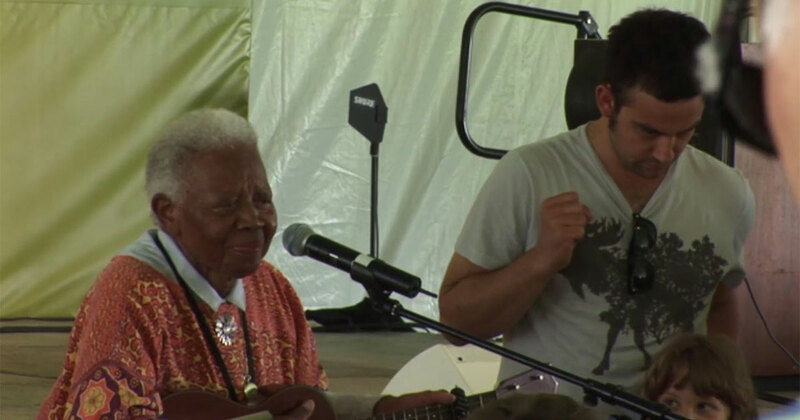 Ella Jenkins, performs for families at the 2009 Smithsonian Folklife Festival.